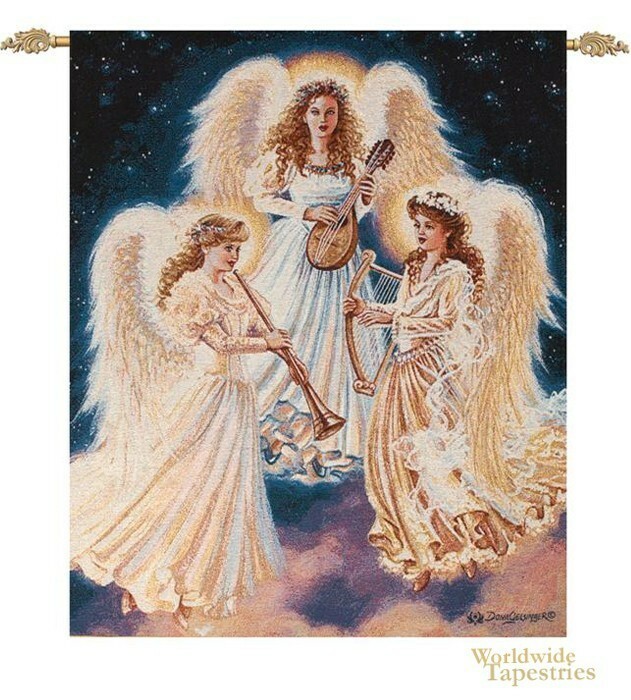 This angel tapestry "Choir of Angels" shows three angels with musical instruments, from the artwork of Dona Gelsinger. Her work of religious icons and topics are beautiful. Here we see three maiden angels, in flowing gold gowns and gold wings, playing the lute, the harp and the trumpet. These three musical instruments are used in religious works since the Renaissance, and symbolise the instruments heard in heaven. They are floating in the glorious deep blue night sky. Gelsinger's first major commission was to paint the Stations of the Cross for St. Denis Church in Diamond Bar, California. Her most well loved works are dedicated to angels. Her works have been used in major publications including Make a Wish Foundation and Chicken Soup for the Soul. This angel tapestry "Choir of Angels" is lined and has a tunnel for easy hanging. Note: tapestry rod and tassels, where pictured, are purchased separately.